The Malmberg family, owners of De Palm Tours. Mr. Luis C. De Palm founded De Palm Tours in 1960. He provided a high level of service, which gave the company a strong level of acceptance in the tourism field in Aruba as well as the travel community abroad. Then, in 1971 Harold D. Malmberg and Ramon A. Richardson purchased the company and immediately began to restructure. De Palm Corporation and its subsidiaries are the now the providers of recreational facilities, activities and services, combined with land and sea transportation. At De Palm, our motto is: “nobody leaves Aruba unhappy!” All the unfulfilled wishes and complaints of our customers are handled and settled before their departure. This commitment to customer service has generated many repeat customers for our travel clients as well as for Aruba and our company. Experience our private island! Your family will enjoy an entire day of water activities and food. Our catamaran snorkeling and dinner cruises are the most fun you will have on Aruba's waters. At De Palm, we are known for our superiority in quality and our unrivaled professionalism. We have the experience and knowledge that travelers are looking for when booking a vacation and our services are the most sought-after in Aruba. We provide numerous activities for our customers’ pleasure: water sports, transportation, entertainment, and even the prestige of a private island for their events. Our Water Sports Company, De Palm Watersports N.V., was founded in 1975. De Palm Tours not only became a pioneer in Watersports, but also made it possible for local residents to enjoy these facilities, which were previously only available to tourists. Today it is normal for local residents and school excursions to go on our glass bottom boat trips and sightseeing tours. In January 1988, De Palm invested in a private island that quickly became the entertainment center for individual visitors, as well as visiting groups and local residents. De Palm Island is suited for theme parties as well as all kinds of other functions. 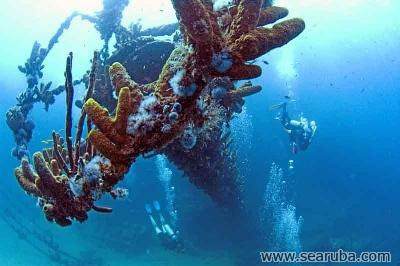 It is located in the midst of fabulous coral reef formations, and is inhabited by the most colorful variety of tropical marine life and fishes, therefore becoming the ideal spot for snorkeling. De Palm Island features several bars, restaurants, a souvenir store, beaches and several kitchens. In addition, De Palm Island has created an attractive destination for the boats of De Palm Water Sports, the busses of De Palm Tours and the Jeeps as well as the Landrovers of De Palm Car rental etc. In other words, these companies have one more place to take their clients to. Port De Palm was built at Balashi on the main island of Aruba - across from De Palm Island to facilitate access to it. De Palm Island owns a fleet of ferry-boats, which are used to take the passengers back and forth between the main island of Aruba and De Palm Island. Future plans include adding the following features to De Palm Island: an underwater park, animal encounters, dolphin encounters, as well as a full fledged scuba diving operation. De Palm Tours also features all-terrain vehicles, which are four-wheel motor bikes, Land Rovers and Wrangler Jeeps. These vehicles are used to organize sightseeing tours, where the vehicles follow each other in a caravan style in groups of not exceeding 10 vehicles. Our Bus & Truck fleet includes 35 deluxe Volvo motor coaches and one small Toyota bus, all air-conditioned with a total seating capacity of over 1,800 passengers. The coaches are also equipped with video players and TVs to offer the best possible information and recreation during the trips. The company also has a fleet of fully enclosed trucks, used to transport group baggage. By separating the transportation of passengers and baggage the groups can leave the airport as soon as they clear customs and do not need to wait for their baggage to be loaded in the baggage compartments of their busses. De Palm Group presently employs close to 300 tourism professionals, who are totally dedicated to the tourism industry. We are considered the most complete destination Management Company in the Caribbean, staffed and equipped to handle any request from the travel industry. We have 15 branch offices in the various hotels and conduct guest orientation meetings at the hotels to familiarize newly arrived guests with our range of activities as well as general information about Aruba. At De Palm, we provide high quality of vacation products to all those we serve. We strive for excellence in everything we do. All our products and services must be of expected quality and cost effective, and we will always deliver what we promise.